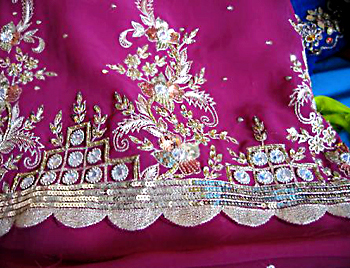 Zari is the main material in most silk sarees and gharara. It is also used in other garments made of silk, like skirts, tops and vettis. Zari (or Jari) is an even thread traditionally made of fine gold or silver used in traditional Indian, Pakistani and Persian garments, especially as brocade in saris etc. This thread is woven into fabrics, primarily made of silk to create intricate patterns. Traditional textile weaving in Iran (Persia) have long tradition of Zari, especially in Zardozi embroidery. It is believed this tradition started during the Mughal era. Today, in most fabrics, zari is not made of real gold and silver, but has cotton or polyester yarn at its core, wrapped by golden/silver metallic yarn. This style of embroidery has been in existence in India from the time of the Rig Veda. It prospered during the Mugal Emperor, Akbar, but later a loss of royal patronage and industrialization led to its decline. Today, it is popular in the Indian cities of Lucknow, and Chennai. The name zardozi is from Persian and means "sewing with gold".